Carousel Coral: My Current Foundation Routine. Hello my lovelies! 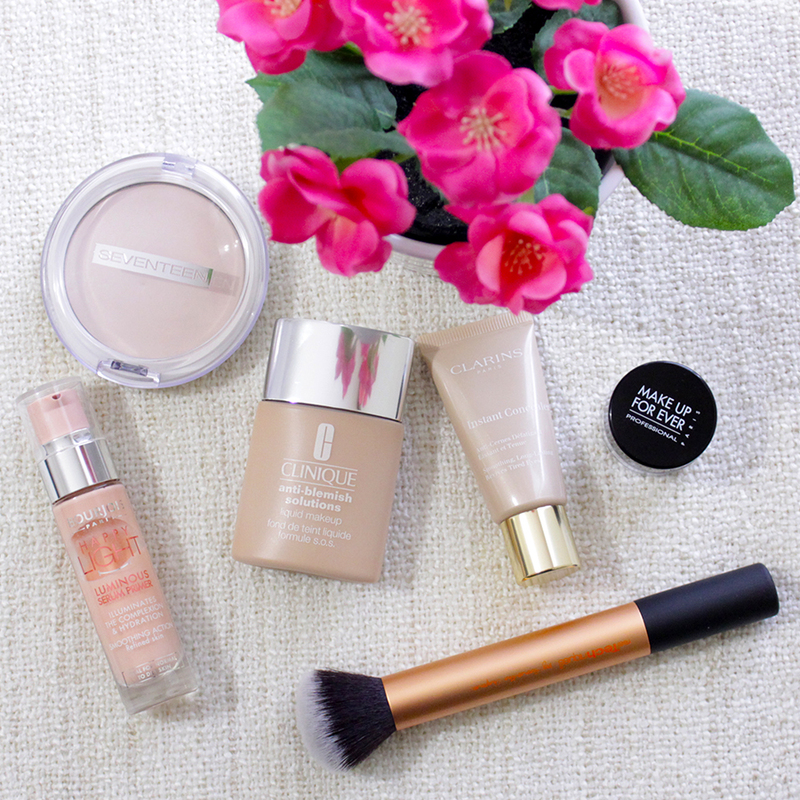 I think it was about time to do a whole post about what face products I'm using and loving right now. These past few months I've been testing out lots of new foundations, concealers and powders and not only for my makeup, I've been testing out lots of new skincare products, but this is going to be a whole different post in the future. 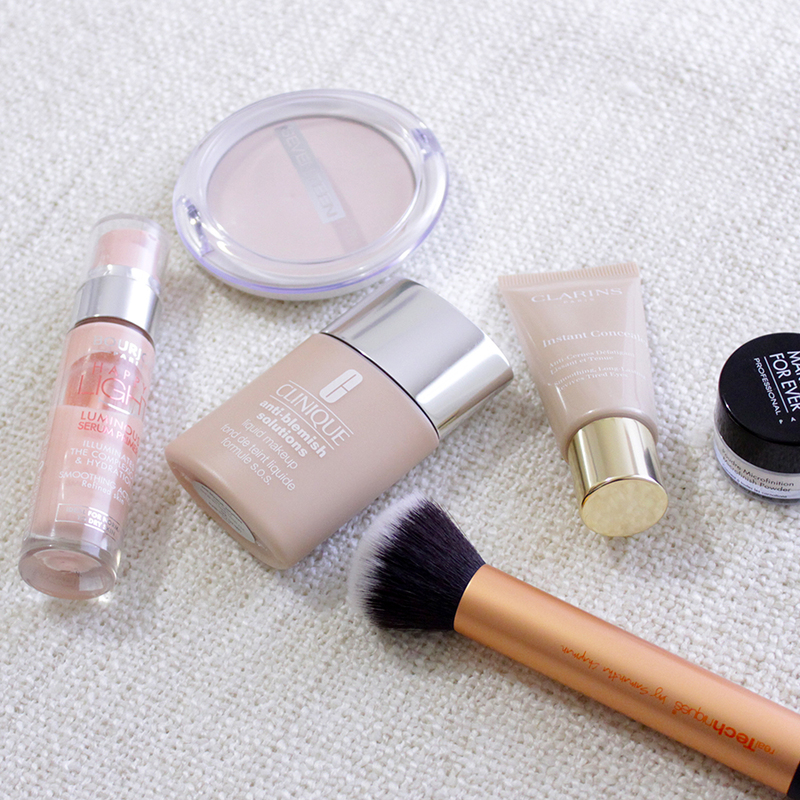 My main reason is because lately my face became more oily, so I've started a new foundation routine. I'm still trying to figure out which products are right for me but for my now this routine seems to work pretty well with my skin. I always like to start with a good base, and the Bourjois Happy Light Luminous primer is one of the best primers I've tried for brightening my face without making it look like an oily mess, it works really well underneath of a medium to full coverage foundation. Not all of the times I do my make up I use a foundation, sometimes I like to use a bb cream or a powder foundation but this post is all about my full face routine, so the foundation of my choice right now is the Clinique Anti-Blemish Solutions Liquid MakeUp. It's very lightweight, it covers really well and it's specially formulated for acne prone skins like mine, I love applying it with the Real Techniques Buffing Brush because it makes it look less cakey. Now it's time of concealing and the Clarins Instant Concealer is one of the best concealers I've ever tried, a bit pricey I know but it's worth it, the texture is to die for. I blend it out with my fingers as I found that they work the best with its creamy texture, and for some more precise blending I use a small triangle sponge. The only problem I have with this concealer is that it's not very brightening but I'll propably get a seperate highlighter for underneath my eyes in the future. I finish the look with a translucent powder, my two absolute HGs right now are the MakeUp For Ever HD Microfinish powder and the Seventeen Natural Silky Transparent Compact Powder, they're both amazing. The texture of the Seventeen powder feels like butter on my face and it does a great job for setting my concealer underneath my eyes, also it does help to brighten up my face because the Clinique foundation tends to oxidise a bit after an hour or so. The MakeUp For Ever powder leaves my face bit more matte than the Seventeen one and it's extremely lightweight. So this was my current full foundation routine! I'd like to know what products you are using and loving right now, and tell me if you've tried any of the ones that I mentioned. Λοιπόν, με τις βάσεις προσώπου δεν ξέρω τι να κάνω. Της radiant μου άρεσε πολύ γιατί μόλις την απλώνεις κάνει το δέρμα ματ. Των sephora που νόμιζα ότι θα ήταν το ίδιο δε με έχει ενθουσιάσει. Όπως περιγράφεις αυτή την bourjois φαίνεται ωραία, θα τη βάλω στη λίστα! Το clinique foundation μοιάζει καθόλου με το Revlon colorstay? Πολύ ωραίες οι φωτογραφίες Σοφία μου, πολλά φιλιά!! Σ'ευχαριστω!! Κοιτα ακομα δεν εχω βρει ενα primer που να βοηθαει αρκετα με την λιπαροτητα γι'αυτο κ το εχω ριξει πιο πολυ στο skincare, δηλαδη σε mattifying moisturizers κ τετοια, αλλα το συγκεκριμενο της Bourjois δεν με κανει πιο λιπαρη ενω ταυτο χρονα δινει κ μια λαμψη. Να φανταστεις το Porefessional της Benefit με κανει αρκετα λιπαρη μονο μετα απο μιση ωρα! Το foundation της Clinique δεν εχει καμια σχεση με το Colorstay, εχει μια πολυ αναλαφρη υφη, κατι μεταξυ μους κ κρεμας κ απλωνεται πολυ ευκολα κ με τα χερια αν θες, με το Colorstay ειχα αρκετα προβληματα δεν μπορουσα να το απλωσω ευκολα, εδειχνε πολυ βαρυ κ κολλαγε. Ξεχασα να σου πω οτι η Bourjois βγαζει κ ενα Happy Light primer Mat, το οποιο δεν εχω δοκιμασει ακομα αλλα σιγουρα θα το κανω στο μελλον. I love anti blemish foundation and I want to try Clarins concealer!! Nice review doll! Χαχαχα μαλλον το λουλουδι θα φταιει! Σ'ευχαριστω πολυ! Θα το τσεκάρω σίγουρα το primer της bourjois! Φαίνεται πολύ ενδιαφέρον!